This breathtaking thriller, originally published the year before the Cuban Missile Crisis under a pen name Lawrence Block never used before or since, is the rarest of Block�s books—and still a work of chilling relevance all these years later, with Castro and Cuba once again commanding headlines. Dana Kaye on KILLING CASTRO: "All you’d expect from a pulp novel, and much more...The history is just as thrilling as the plot and Block excels at balancing the two." Booklist on KILLING CASTRO: "Hard Case Crime continues to resurrect early work by genre salwart Lawrence Block [and] this one may be the most interesting find of all...plenty of blood and bullets and, as always with Block, a fine feel for character." 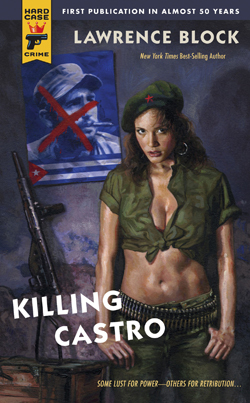 Publishers Weekly on KILLING CASTRO: "Absorbing...[an] intense, taut thriller." "Exceptional...a whale of a knockout punch to the solar plexus." "The reader is riveted to the words, the action."